Periodic comet Encke has been observed through the most perihelion passages of any comet seen by humans. This is partly due to the comets record short orbital period, but also due to is relatively high activity level (especially during its first observed apparitions in the 18th and early 19th centuries) and its small perihelion distance. It was first discovered by Pierre Mechain in January 1786 and rediscovered 3 orbits later by Caroline Herschel in 1795, followed 3 orbits after that by Jean Louis Pons, Huth, and Bouvard in 1805. The orbital period is about 3.3 years, so that every 3 orbits, or nearly 10 years, the comet returns to a similar configuration with the Earth. 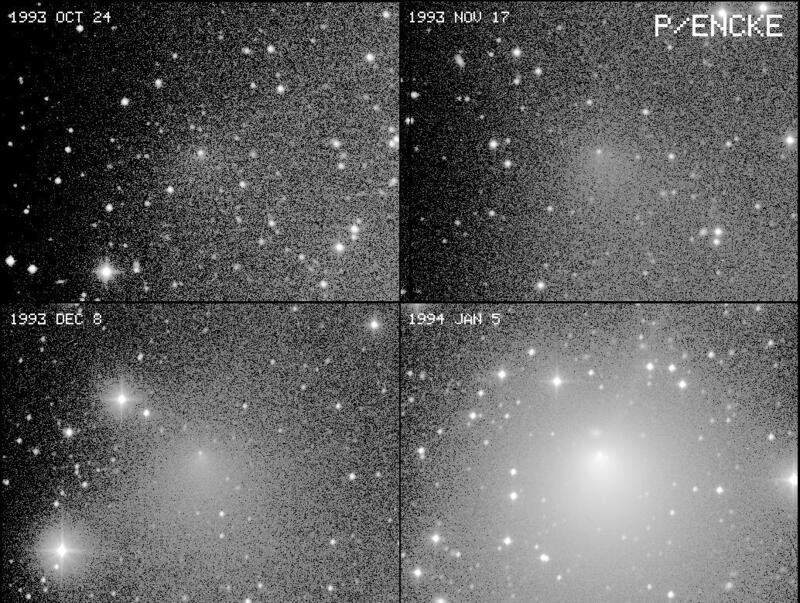 During its 1994 return to perihelion, I was able to obtain images of the comet during each of 4 lunations before perihelion (which occured on February 9, 1994) which show the rapid developement of the comets coma. I've combined them into a mosaic for easy comparison of the 4 images. The 1993 October image shows only a faint coma and a hint of a tail or dust trail towards about 2 o'clock - the comet is nearly stellar in appearance. The 1993 November image shows a brighter coma and perhaps a tail towards about 4 o'clock. The 1993 December image shows a fan shaped coma, but the nuclear condensation has not significantly brightened. Finally, the 1994 January image, taken about a month from perihelion shows a huge increase in the comets activity with the nuclear region now much brighter, a large coma and a tail or dust trail heading off towards about the 1 o'clock position angle.